I wouldn’t necessarily say they saved the best for last, but there is a finality to Genocide that makes it the perfect choice to round out When Horror Came to Shochiku. Released in 1968, Genocide was directed by The X from Outer Space’s Kazui Nihonmatsu [review], who here perfects his gonzo mash-up style while also taking his anti-war and technology themes to their furthest conclusion. At stake this time around is pretty much everything. 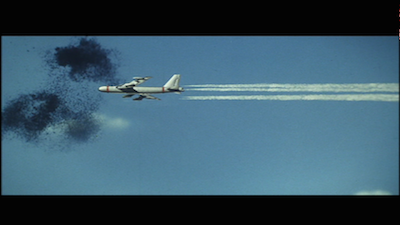 Once again, the movie opens with an incident involving an aircraft (see also: Goke, Body Snatcher from Hell [review]). 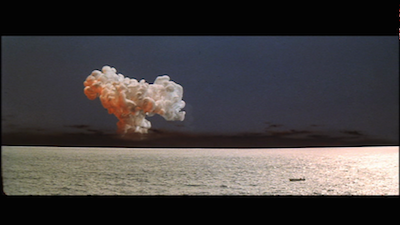 In this case, a U.S. bomber flying over a Japanese island carrying a hydrogen bomb. 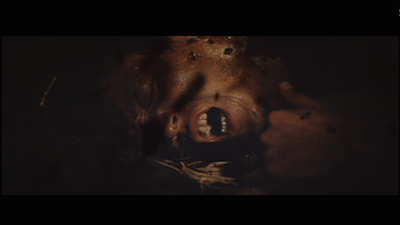 A swarm of insects sets upon the craft, first causing a PTSD freak-out from one of the crew members, an African American solider named Charly (Chico Roland, Black Sun [review]), and then disabling the engines, forcing the crew to eject their cargo and bail out. Things only get more complicated from there. The Americans mobilize to find the lost bomb, and when the rest of the crew is found dead, an amnesiac Charly is the only key to figuring out where the explosive ended up. 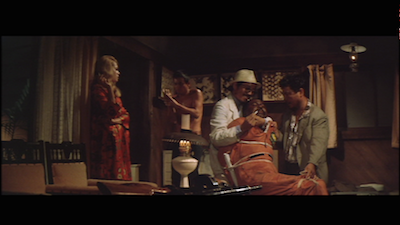 Meanwhile, one of the islanders, a bug collector named Joji (Yusuke Kawazu, The Inheritance [review]), turns up in town with a U.S. Air Force watch and finds himself charged with the murder of the dead pilots--even though the cause of death is quite clearly some kind of pestilence. Joji’s sweet wife Yukari (Emi Shindo) goes out of her way to help her man, even though it’s rumored that Joji has a white girlfriend on another island. 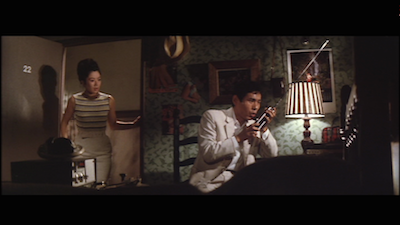 Yukari summons Dr. Nagumo (Keisuke Sonoi, also in The X from Outer Space), a scientist Joji collects bugs for, to help him escape the murder charge. This works out, because Nagumo has seen some strange goings-on in the insect community that he’s eager to check out first hand. Convoluted enough for you? Well, just you wait. The United States is not the only one on the hunt for the lost atomic weapon. There are also “Eastern Bloc spies” in the mix, and one of their number is Annabelle (Kathy Horan), Joji’s alleged girlfriend, who not only turns out to be a bit of a bug aficionado herself, but she’s also an Auschwitz survivor who hates all warring nations. The Americans are just as bad as her Nazi captors since, after all, they unleashed nuclear horror on the world. All of these crazy insects are Annabelle’s, she’s been breeding them to be more poisonous and wants to use them to destroy mankind. Only not so fast, Annabelle! If sci-fi horror movies have taught us anything, it’s that nature is not as cooperative as all that. When Charly escapes Annabelle’s clutches--did I mention her Commie henchmen kidnapped him after he got his memory back and told everyone his buddies were killed by deadly bugs, not Joji, but Joji himself had already escaped and hooked up with his white ladypal?--the bug poison in his body causes him to hallucinate and rant about the genocide that we were promised in the title. Curious as to whether it’s all in Charly’s head or perhaps he’s maybe seen some truth the sober eyes are unable to envision, Dr. Nagumo lets himself be bitten by one of the bugs. Once the venom hits his bloodstream, Nagumo finds himself part of the hivemind, and the chatter between the winged terrorists reveals that they are also trying to rid the Earth of humanity. It’s one thing if man wants to kill himself with atomic energy, but the insects aren’t going to sit by and let the humans kill them, too. Thus, this crazy film becomes a race against time. Who will triumph and get the bomb first? The Americans? The Communists? Why don’t Annabelle and the bugs realize they have a common goal? What of the fact that Yukari is expecting? Should she bring a baby into the world when its father is heading to the gallows? There is a lot to parse through in Genocide. While the peace message is the most prevalent, Nihonmastsu and screenwriter Susumu Takaku complicate things by also touching on misogyny, racism, and the granddaddy of modern existential problems--just because science allows us to do something, does that mean we should? Not to mention the film’s climactic conundrum of whether or not it’s reasonable to sacrifice the few to save the many. This last question can’t be answered with any real satisfaction, as the violent shootout between the two sides (irony?) ends in calamity. The final shots show us a most terrible conclusion, but also one glimmer of hope. Kind Yukari has escaped on a tiny boat, away from the carnage, mother and child serving as the last salvation for humanity. 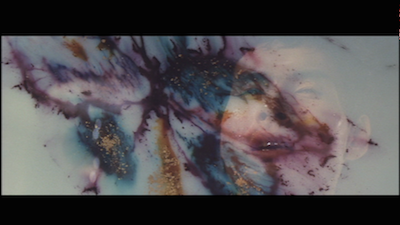 It’s like the end of Children of Men [review], only with no hint of a rescue. 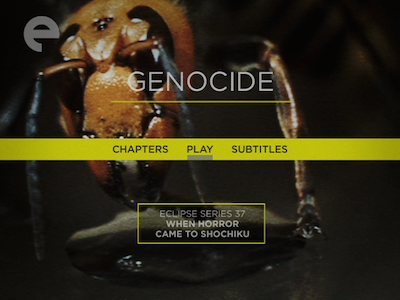 In terms of style, Genocide fits in with the other films in When Horror Came to Shochiku: cheap special effects, science gone wrong, the ghosts of war invading the present day (and represented visually by intrusive, abrupt inserts), and a general distrust of mankind’s most common impulses. Just as Goke’s alien invaders saw us as hopelessly caught up in our own drama, so too do the bugs here completely dismiss any notion that we can save ourselves. Perhaps that’s why they decide not to go along with Annabelle, the human factor is unpredictable and she could make things worse for them in the long run. This is horror as nihilism. No ghouls, goblins, or golems will ever be as terrifying as we are ourselves. The faint glimmer of hope that an individual might stand up and do the right thing is dashed time and again, the efforts that one person makes aren’t enough, the fight is futile, the bomb drops anyway or the aliens have already won, and even if we could pick up and carry on, the planet doesn’t want us anymore. Consider it this way: the bugs in Genocide could just be a metaphor for climate change. In both cases, we have manufactured the problem in the name of progress, and reversing what’s already been done seems nigh impossible. Though the movie is bizarre and freakish and as unpredictable as a practical joke, the punchline is all kinds of chilling. Excuse me while I go pour myself a good stiff drink.